This spring, my class took the most incredible field trip. We saw a short musical production in a local historic theater that provided our artist in residence experience. Students also participated in a backstage tour to learn about how the productions are created as well as more about the history of the building. Next up was a scavenger hunt throughout a small historic part of our city. Local history is our current social studies topic right now, and students are in the process of choosing their five most interesting people, places, or events from our city. Students are also interacting with Charles Demuth’s I Saw the Figure 5 in Gold during class. They are creating their own version of the masterpiece. (This will become the cover of a book about those five local items they choose. Find this lesson here.) 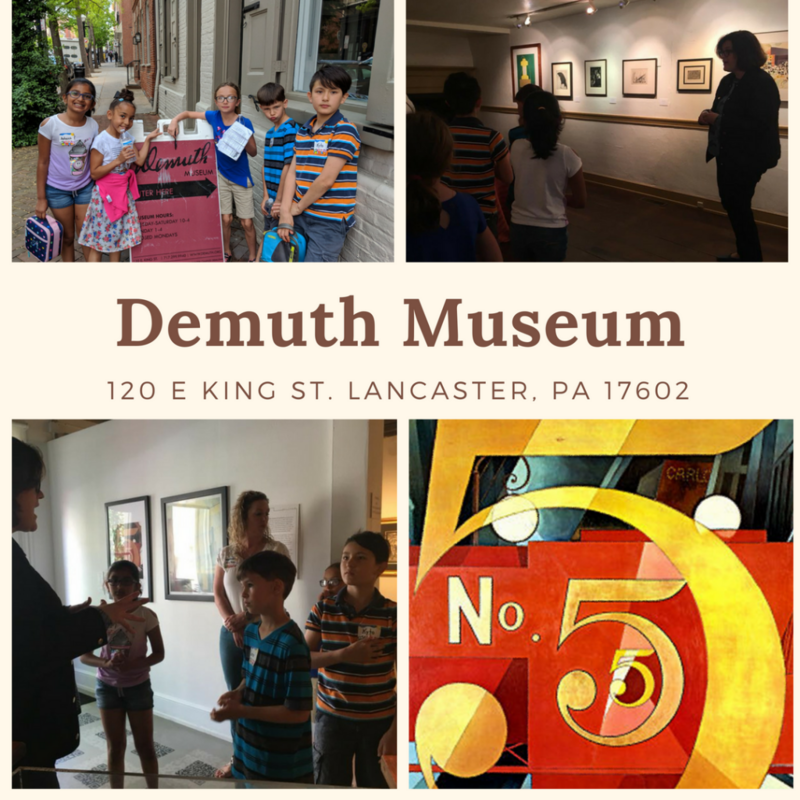 Charles Demuth’s house, now a museum, was part of our scavenger hunt. Watching these 9 year olds stand in Demuth’s bedroom, exhilarated by the art and history they were experiencing, was nothing short of magical. While we were only 7 minutes away from our school, total immersion in a different location that was tightly connected to what we were learning in class was incomparable. I could tell from my students’ faces and from their reflections after the trip. Make sure the trip ties in with your curriculum. Sure, students enjoy a trip to a science museum or a visit to a zoo – they will certainly learn from almost any new experience. However if you are only going on the trip because it is a tradition for your grade level, you may be missing an opportunity for a better experience. It is easy to make a general connection to something that is taught during the year, but the more closely you can weave your instruction into the trip the more amazing the trip will be. Make a wise choice in venue. Think about your content: is there a topic that is difficult for students to grasp because they don’t have enough background information? Or is there a unit that you teach that you could almost replace by actually being someplace else? Maybe it is just an extension, and seeing something in person would simply make it come alive for students. The right venue can be tricky to find depending on cost, travel time, and size, but it can make all the difference. Don’t rely on the venue to create the experience. This is especially important when planning a trip to a city or a museum with self-guided exhibits. Visit ahead of time, and take note of what you want the students to notice and learn. Of course, the educational staff at your venue are experts, but they don’t know your curriculum or your students. Use the venue’s guide as a starting point, and make it your own. Plan the pacing of your experience. If your students aren’t used to listening to lectures all day at school, make sure they aren’t required to listen for an extended time on the trip. Plan a mix of active and quiet activities, and make sure to share that schedule with students just before the trip. Work the trip into part of a PBL unit. Plan a trip that includes information that students need to gather in order to use it for a project. For example, arrange a partnership with the venue and ask if it would be allowed to place QR codes at certain locations. On the trip, students could take photos and research assigned locations. Back at school, students could prepare educational videos or presentations to link to the QR codes. Create a scavenger hunt for students. If a PBL experience is not an option, structure students’ experience with a scavenger hunt. When visiting the venue and noting what you want students to notice and learn, use your notes to create a scavenger hunt that guides the students to find those answers. Creating a scavenger hunt holds students accountable for learning and sets the purpose for learning. It also helps chaperones, since many times they are responsible for guiding small groups. A curriculum based scavenger hunt ensures that each student group gets an equitable experience regardless of their chaperone’s knowledge of the venue or topic. Summer is the perfect time to plan a field trip for next year. Grab a teacher friend and visit local destinations to determine what fits best with your curriculum. Once you find a match, explore that venue and create your scavenger hunt. Many venues have educator passes or educator days that allow you to visit ahead of time for free or at a discounted rate. If not, sometimes smaller venues will waive the ticket price for you if you call ahead and explain why you’d like to visit. With some interesting legwork this summer, you can guarantee a wonderfully meaningful field trip during the school year. Don’t forget to take your camera!